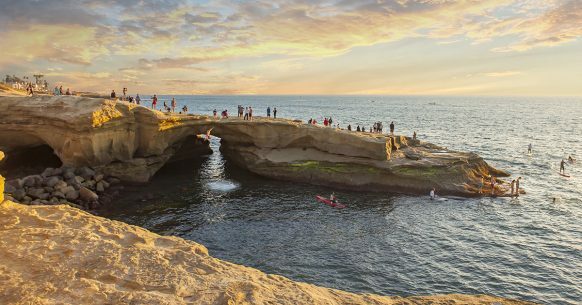 San Diego’s beaches are so inviting, you might never want to leave. And you don’t have to, because these beach neighborhoods of Pacific Beach, Mission Beach, and Ocean Beach have it all. Amusement parks for the whole family, piers and beaches perfect for long strolls, and of course, sips and bites to enjoy with a fiery sunset—it’s all here, within earshot of the waves. Since 1925, this oceanfront amusement park in Mission Beach has been putting smiles on people’s faces. Today it’s still a great place to grab an ice cream or a drink, tap into some healthy road rage on the bumper cars, or get a bird’s eye view of the San Diego coastline from a car on the iconic Giant Dipper rollercoaster. No waves in the ocean? No worries. Head to the Wave House, where beginners and experts alike can test themselves on two different kinds of stationary waves, while others can spectate amidst restaurants, bars, and live music. South of Ocean Beach, Sunset Cliffs Boulevard winds to an end at a 68-acre swath of open space along the rugged coastline. You can take in the ocean view without leaving the parking lot. Or, carefully find a way down to the beach, where during low tide you can explores miles of undeveloped cliff-lined shore with only seabirds for company. Ocean Beach’s half-mile-long, T-shaped pier is the longest concrete pier on the West Coast, and as good a place as you’ll find to take a breezy stroll, drop a line in the water, or drink in a view of La Jolla or Ocean Beach. There’s a restaurant and bait shop on the pier, so there’s no need to return to land if you get hungry during a long day of fishing. But when you are ready to head back to town, the base of the pier is right in the thick of OB’s many restaurants, bars, surf shops, and boutiques. This mile-long stretch of central Pacific Beach offers daytime visitors plenty of shopping – including boutique shops, kitschy retro classics, SoCal surf wear and plenty of places to grab a bite. Nighttime visitors can experience a youthful, vibrant scene – often home to the college crowd – with plenty of live music, bars, and late-night eats. Whether by bike, scooter, roller-skates, or foot, this oceanfront boardwalk spans three miles of sand, waves, restaurants, shops, and the Crystal Pier. Use it as a thoroughfare between Mission Beach and Pacific Beach, or just a way to feel the breeze and take the pulse of San Diego’s beach culture. You could spend every day of the year at a different excellent beachfront bar in San Diego. But why not start at Pacific Beach AleHouse, where their own beers like Grand Ave IPA and Soledad Stout are served alongside upscale bar fare such as ahi tuna sandwiches, lobster rolls, and steak frites. Restaurants that have as impeccable a view as JRDN don’t always need to impress patrons with their food. JRDN does not let its view of crashing waves stand as an excuse not to serve top notch food and drink. In a refined setting—outdoor seating available—you’ll find breakfast, brunch, lunch, and dinner menus featuring everything from inspired cocktails and steel cut oats to King Crab legs, nigiri, sashimi, and roasted beet salads. This entry was posted in Arts & Culture, Culinary, Family Vacations, Outdoor Adventures and tagged entertainment, mission bay by San Diego Magazine. Bookmark the permalink.